Briogeo Don't Despair, Repair! Strength + Moisture Leave-In Mask is an intense, yet lightweight conditioning treatment made with clean ingredients. It's become one of my new favorites in my hair care regimen this summer. Briogeo Don't Despair, Repair! Strength + Moisture Leave-In Mask works to restore essential hydration to dry, damaged, over-processed hair. Formulated using a unique micro-encapsulated argan oil, this leave-in mask delivers an optimal blend of B-vitamins, argan oils, algae, and biotin to replenish damaged hair to a shiny, healthy-looking, and lustrous state while providing smoothing benefits. This leave-in mask also provides heat protection from hairdryers, flat irons and curling irons. 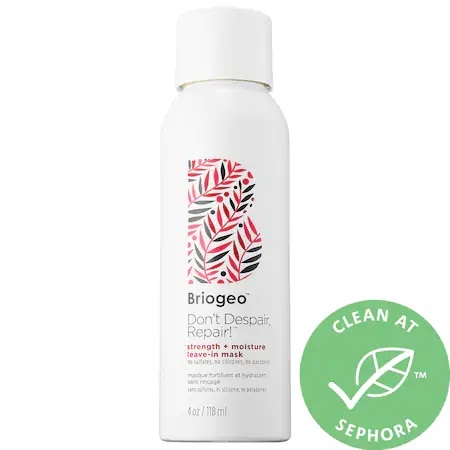 The first feature I loved when I used the Briogeo Don't Despair, Repair! Strength + Moisture Leave-In Mask was it's fresh, clean scent. Then I was impressed by how lightweight the cream felt in my hands and once I applied it throughout my damp hair. Even before drying and styling, it made my hair instantly softer and smoother. I got great results both by allowing my hair to air dry, with it staying smooth and sleek, or after blow drying it, with it drying very smoothly and having a nice, natural shine. My hair didn't feel oily, sticky or greasy, yet it definitely had the additional moisture I needed. Briogeo Don't Despair, Repair! Strength + Moisture Leave-In Mask is vegan, cruelty free, and formulated without gluten, DEA, silicone, or artificial dyes. It is color-safe and safe for use on chemically-treated, relaxed, and keratin treated hair.